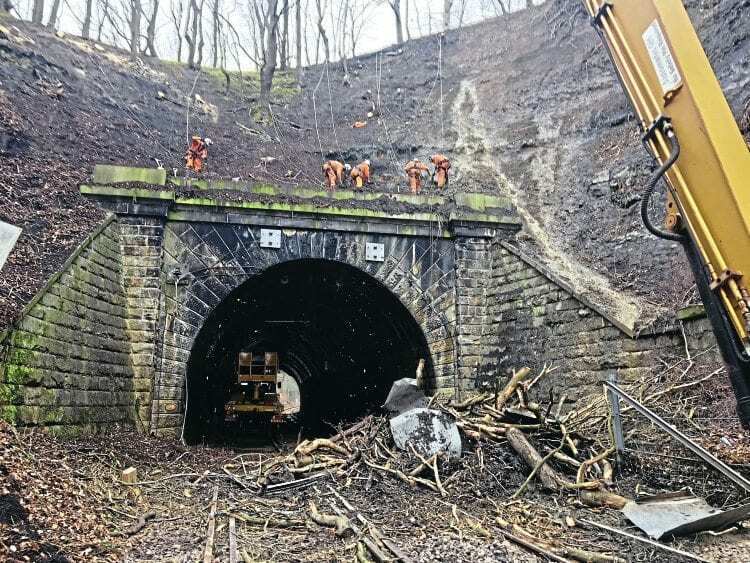 TRAINS were suspended on the Leeds to Ilkley route in West Yorkshire between April 3 and April 9 after a landslip occurred at Springs Tunnel, south of Guiseley station. Around 80 tonnes of debris, including large trees, slid down a steep bank above the southern portal of the tunnel on April 3. The line was closed for safety reasons after an Arriva Northern driver reported seeing trees perched precariously above the line. Because of the difficult location, it proved impossible to remove the debris from above, so all material was brought onto the track below and removed. As a result, 25kV AC overhead line equipment also had to be removed and reinstalled once the debris had been cleared.